Hello everyone! Well I'm new to corona, but here is my current interior design project viz I've done/doing using corona for the first or almost the first time, the design itself is still in active development stage but sadly, now it's more drawing hvac/plumbing and scheduling time (oh how I hate those) so currently I'm unable to make those renders better/more realistic. 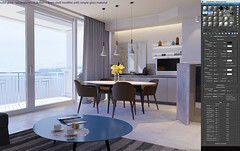 I know there are plenty of mistakes in design and in viz in particular (damn that constant lack of time) and I wouldn't be posting such shamefull renderings from worked on project, If not for my urgent craving :) for daily builds, which got some really necessary features which I hope will make using corona renderer much easier for me. So here they are, I hope I didn't screw up too much :) and also hope I will have some time to make em better later. Tried to match colors and brightness levels on all of them to be the same - well got get them to be pretty close. Oh... so you just did not let them cook long enough. Most of the people have noisy renders because they wait for hours and then give up as the noise does not go away. While sometimes it is problem of a wrong setup, there are still cases when corona simply does not handle given scenario efficiently. Here goes another renders, hopefully not so pitiful as the ones before and even more hopefully not even fails at all, yet I still think something is amiss but at the moment I just can't see what exactly. Hello again, here I've done some more tests regarding the difference in specular/reflections using solid or thin glass and even solid glass plus thin material in windows using hdri for environment lighting, well that will probably apply not for just hdris but for corona sky too though that need to be tested.